Vat allocation forms, show conditions and show exhibitor rules. per person, a second additional vat may be available if all 30+ vats are not allocated or cancellations arise. Cost of entry will be £35 per vat. All applications to be returned no later than 24th March 2018. 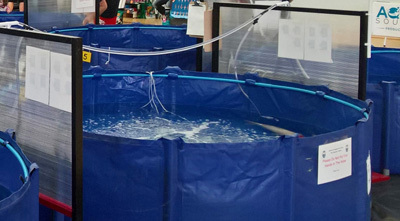 Please note, Vat sizes are 6’ and 8’, due to the limited numbers of 8’ vats these will be allocated on a first come first served bases to exhibitors with larger koi. time decided for de-benching, unless there is a problem with a particular fish / vat or permission has been given from the Show Chairman. In case of any emergencies your telephone number will be listed on the reverse side of the vat board. Each exhibitor will be able to inspect their own water testing sheets if they so wish. 1. The Committee reserves the right to refuse booking or entry to the show without explanation. 2. All fish exhibited in the show are done so at the owner’s risk. 3. All fish MUST be double bagged with oxygen and boxed arriving at the show and departing the show. 5. No food is to be placed in the vats. 6. The decision of the benching team will be final. 7. Anyone attempting to influence the decision of the judges will be asked to leave the showground. All judge’s decisions are final. 8. The NEKC will not be held responsible for any accidents or incidents that occur to vehicles or property within the show grounds. The cost of any damage found to have been caused by anyone ignoring this rule will be borne by the member or entrant responsible.